Have this clip on flashlight handy whenever you need a mini torch to light your way through the dark. A quick and easy attachment and bright, long-lasting light make it a staple for everything from daily life to overnight adventures. Clip on to the back pack, purse, dog collar, tent zippers, kids jackets or anything you want to make more visible at night. Long lasting mini LED torch light. Water resistant. Twist the cap to turn the light constant/steady on or off. 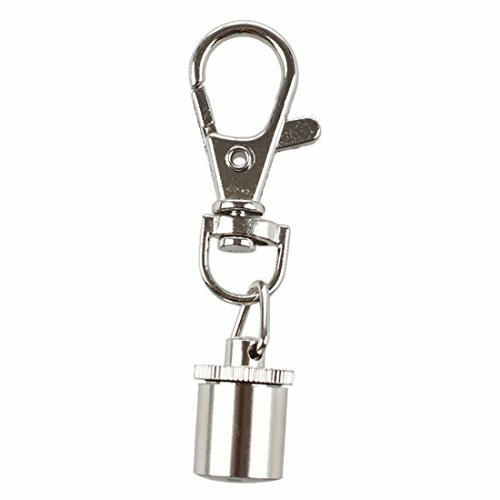 Total length of LED light and carabiner clip measures approx 2.25" inches long. Diameter of barrel housing is approx 3/8" of an inch. Takes 3 x LR41 batteries (included). Batteries can be replaced by unscrewing the case.